I thought we’d have a change for Easter this year and have this traditional cake from Sicily which is served at Easter and other celebrations. 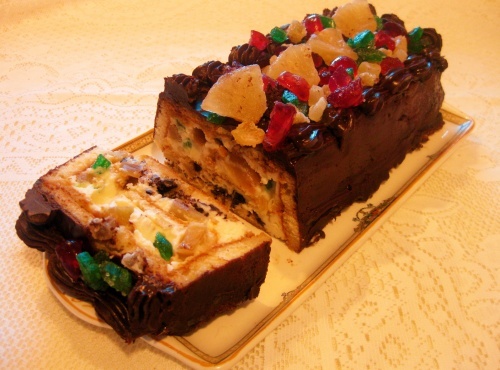 There are several versions but all are made from sponge cake, cream cheese, glacé fruits and chocolate. Strega is used in Sicily but I substitute brandy or sweet white wine. I find the rectangular form easy to slice. You will need a 2lb loaf tin measuring approx 10x20cm (4x8 ins) across the base and a piping bag with a star tube. Chop the glacé fruits and place them in a basin with the alcohol and leave them to soak. In a bowl mix together the cream cheese, mascarpone and sugar. Line the tin with cling film, folding excess back over the sides of the tin. Split the sponge cakes across into two thin halves. Line the base and sides of the tin, cut side outwards, trimming them where necessary. Drain the liquor from the fruits and sprinkle it over the cakes. Mix the fruits with the cheese mixture, use half to cover the base sponge. Put another sponge layer on top and then the remaining cheese mixture. Cover with the remaining slices of cake. Fold back the cling film over the top and place weights on top. Put it in the refrigerator for a few hours or overnight. Invert it onto a serving dish and remove the cling film. Icing: melt together the butter and chocolate over a pan of hot water. Don’t allow it to get too hot, then leave it to cool slightly until coating consistency. Coat the top and sides of the cake, reserving remainder until it is firm enough to pipe a border on the top. Finish with chopped glacé fruits. Keep in the refrigerator until required. Note: if sponge cakes are not available use slices of bought madeira instead.